I am happy that I came to join. I learned that God is the greatest creator of the earth and universe. I have learned to worship, to have fellowship, to play, to swim and to study. I believe more in God and I am more hardworking. I have learned lots of things from 40 Days Of Purpose. One of them is fellowship and forgiving one another or just saying 'hi' to someone whom you haven’t seen for a long time. I also learned that little children like us can also be great help to God through spreading the Gospel with the wordless book that our teachers gave us. The most important lesson that I have learned is to know how much God loves me. I also learned to love the people surrounding me especially my brother Joshua and sister Elena. I used to make them angry but now I quarrel less with them. Now I stopped myself from saying not so nice things to them. I do all this because I want to please God. I am glad that I joined. Now I know how to share things with others and know how to care for others. I am very happy that I come to join this programme. I want to read the bible to learn more about Jesus and imitate Him in every way. I want to be more obedient to my parents. After the 40 Days I will love and care for my friends. 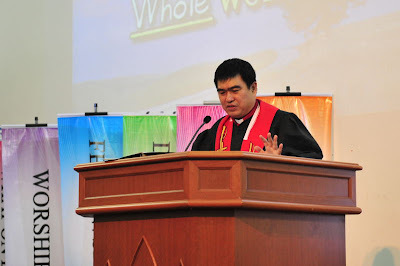 Message by Rev Law Hui Seng, posting by James Wong. Praise the Lord for the potential nine likely-to-be-formed cell groups after 40 DOP. I am very excited to guide these new groups to settle down and make disciples of them. 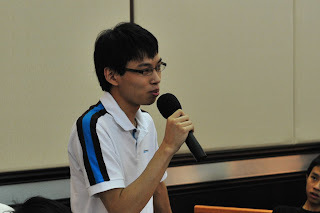 I have spoken to Brothers James Wong, Dasline, Aaron Hii, Andy Chew, Charles Ling and Sisters Regina Tan and Siu Yew about the formation of new cell groups. 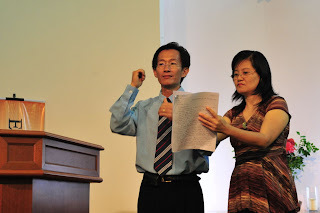 Seven groups (including one group under me in Mandarin, Tuesday morning 8.30-10.00) will definitely be formed. They have confirmed their leadership and the material to be used. The campaign committee has decided on Monday(11th August) that those groups which do not know what materials to use are recommended to follow through the useful additional study notes in the 40 DOP guidebook. a. Praise and thank God for He is the one who causes the new cell leaders to emerge. They make themselves available to Jesus and commit to make disciples in cell groups. b. Thank God for the new members (about 30) who join the cell groups; and there are a few who are not baptized have joined. I baptized one person. d. Pray that we are able to satisfy the needs of the new cell groups and the new cell group will reach out to more non-Christians and backslide Christians. e. Pray that our campaign committee members will continue to function for another six months before we dissolve it. 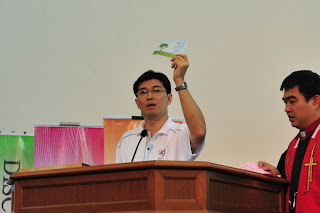 Message by Rev Law Hui Seng, photo by William Ting, posting by James Wong. Praise the Lord for He is the One who sustained our 40dop. 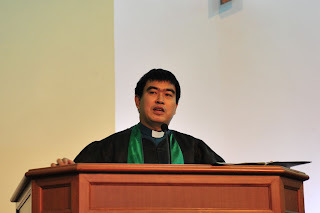 I experienced unity of the whole church this time. With those 5 purposes driven home, now, we have a 'common language' to talk about and serve God. People who have read about the heart beat of God in those 5 purposes will understand better now when we do them. Now, they have a good understanding, the challenge next is to mobilize them to do them. The task of mobilizing them is easier now as they understand the significance of the 5 purposes. I would like to take this opportunity to thank the Campaign team and the Sub-Committee members and Small Group leaders and all those who were involved in this campaign for doing a very good job. You all really have made a difference for Jesus. 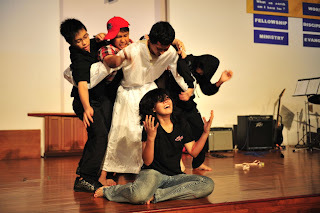 This is especially in terms of unity expressed; the number of non-Christians (at least 20) whom we have reached out; the nine cell groups which may be formed; two new youths who have joined i-Youth; Boys’ Brigade, Girls’ Brigade and Sunday School had successfully completed the 40 DOP; at least 4 backslide brothers and sisters I know have come back to church service; at least thirty five people who have been recruited to do different ministries and mission; and most important of all many lives who are transformed. a. Thank God for the great opportunity to do 40 DOP. Whatever that has been achieved, let us give glory to Him. b. Pray that God will raise at least 9 new cell leaders to do the job. 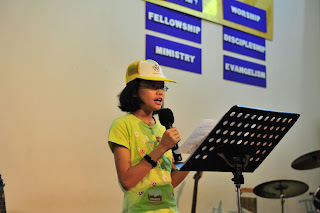 Pray that they will have great sense of mission to make disciples. c. Pray that present cell leaders and new cell leaders will find the time to meet to discuss and do follow up on the new members. d. Pray that church leaders are able to guide the new members to grow to spiritual maturity by using the present material. 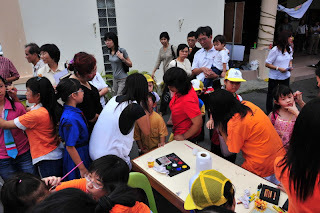 Photos by William Ting, posting by James Wong. 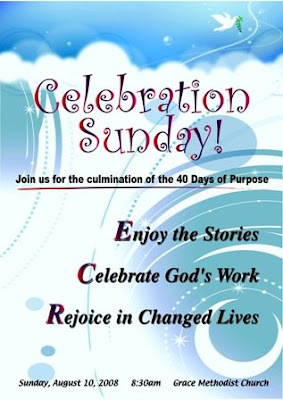 Celebration Sunday, the grand finale of the 40 Days of Purpose programme was held during the morning service yesterday. 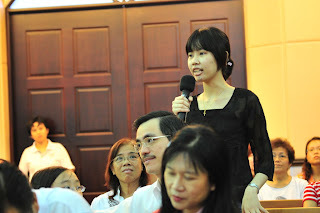 The highlight of the event was when participants shared how their lives were being transformed during the 40 days. 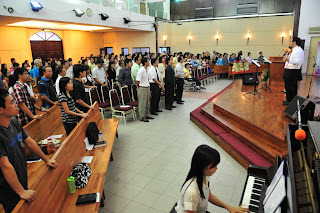 During the launch of the new song "Heart of a Servant", a number of participants came forward when Pastor Law called upon those who wished to re-dedicate their lives to Jesus. The presence of the Holy Spirit was felt during the call. 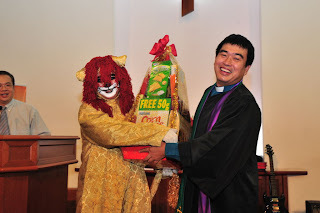 The prize for most impressive booth went to Sunday School and i-Youth Ministry came first in the category for recruiting the most new volunteers. There was also a special moment to appreciate the Hidden Heroes in our church - that honour went to Johnny and Felice Ling, whose family has served with much dedication and humility in GMC since 1982. 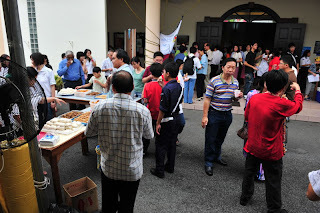 A luncheon was held in the church compound after the service where families continued to celebrate and fellowship with one another. All glory and thanks to God! 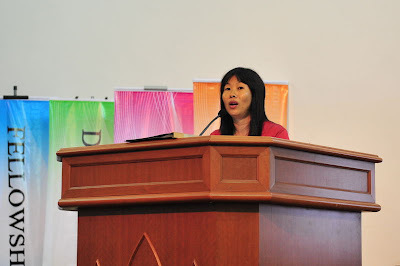 Message by Pastor Connie Yong, photo and posting by James Wong. Pray for God’s Great Commission to be proclaimed and fulfilled powerfully through the 40 Days of Purpose Campaign. Pray for people to devote their lives to telling others across the street and around the world about the life-changing power of a relationship with Christ. Pray that our church will be inspired to work hard to reach out to our community with the Good News. Pray that the Missions Fair event will encourage everyone to become involved in outreach to our community and missions to the world. Pray that people would surrender fully to doing their part to fulfill the Great Commission in their generation. Message by Sii Ling. 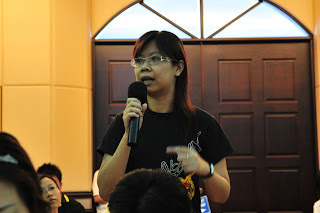 Photo by William Ting, posting by James Wong. I never knew the importance and significance of MISSIONS until I participated in my church's local and overseas mission trips in 2004. Five years ago when church leaders or pastors asked me to join a mission trip, I would give excuses such as I was very busy with my career; no time; didn’t have any talent to serve ; I had allergies; I suffered from land sickness; sleeping adaptability in a new place is a problem; frail health; not well-versed with the Bible etc. “Go to the people of all nations and make them my disciples. Baptize them in the name of the Father, the Son, and the Holy Spirit, and teach them to do everything I have told you.” (Mathew 28: 19-20). This Bible verse does not make sense to me. To me, evangelism is the sole duty or responsibility of the church pastors and missionaries because they are paid, or it only applies to those retired; those who are more holy; those who are rich enough not to work and so they have the time and they should do missions. Besides I used my human mentality to think that I am an OKAY Christian. I observe the Ten Commandments; I attend church Sunday service: I also tithe and serve in a few ministries; I share my Christians faith with my family members and friends and relatives. I am satisfied that my family and friends are coming to Christ. God should be pleased with my life. 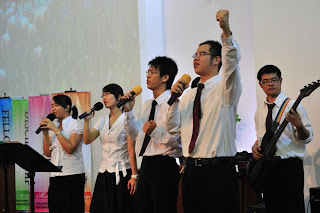 However God broke my low human mentality on the significance of Missions through sermons and Christian songs. Pastors often reminded the church Christians to join at least one mission trip before we go and see the Almighty God one day; and we should spend at least one year of our life-time to do mission locally or overseas. 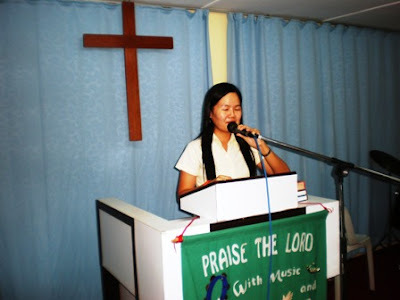 My first church mission trip to Ulu Kapit was in 2004. 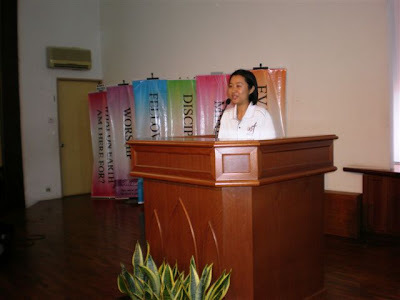 Then it was followed by a Medical mission trip to Cambodia in 2005, Mukah mission trip in 2006, and Pa Adang mission trip in 2007. Those were the most meaningful spiritual breakthroughs that I have ever encountered and it became a turning point in my life. Each mission trip that I joined, there are precious spiritual lessons that I learn. I learned to fast and pray, and intercede for the team members and ask God to unveil my spiritual blindness in His leading. 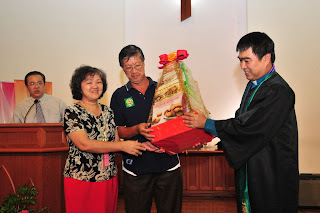 From the local Ulu Kapit and Mukah mission trips, I experienced close fellowship, love, joy and unity among fellow Christians. The trips were fun, enjoyable and easy to conduct. God knows our limitations and physical fitness, it is our heart that He is looking for to take interest and partnership in His work- to bring the Good News to the unbelievers as we are the messengers of God’s love and purposes to the world. Most importantly, missions can only be done during our time on earth. Praise the Lord we have gone this far. You have only 7 chapters to go. I am sure as you look back, you really thank God you have participated in this campaign. The reason is simply because you have learned so much about God's divine purposes (Worship, Fellowship, Discipleship, Ministry). And now, the the fifth purpose - Evangelism (Missions). I pray that as you read you sense the deepest heart beat of God for your life; Evangelism - that is simply to bring good news to those who do not know God yet. As Pastor Rick Warren put it in a most simple manner, and he simply drives home the point only Christians (disciples) have the privilege to do it. I really pray that you will catch the vision to do mission. You will realize you are created by God to do mission. The boundary to do it is to "the ends of the earth". 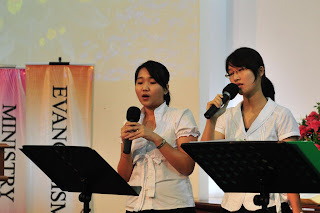 Our church targeted and adopted Ang Kro Sang in Cambodia. We have formed one team to go there and there are still 5 vacancies left for another team. The date is 15-22 November, 2008. By all means, grasp the opportunity, go and make a difference for Jesus. My wife has signed up to go. 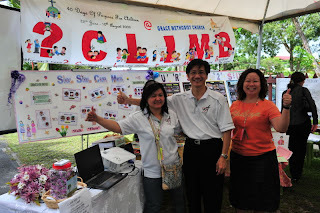 At that time, I will be attending SCAC, we have arranged for my auntie to take of our 4 children. We do this by faith. 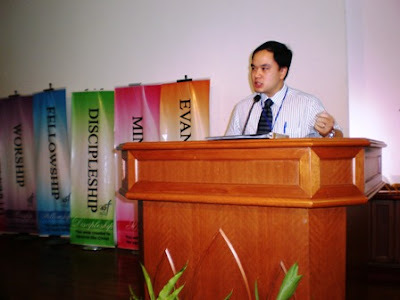 GMC vision is that by 2010, we will see 2 persons coming forward to be long term missionaries. We still have 30 month to pray and trust God. Let us pay the price to do mission and only then it will make a difference for Jesus. 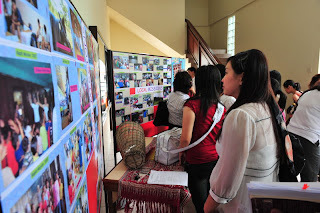 More than 50 people responded to the Ministry Fair last Sunday and this morning we witnessed the Missions Fair being successfully launched after church service. 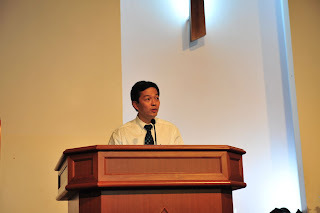 Keith Chin, the Missions leader in our church gave a convincing introduction before the Fair started. 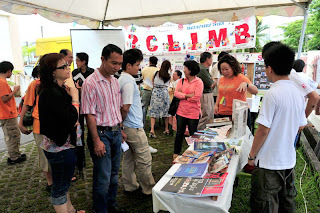 The three booths featuring Overseas Missions, Local Missions and Social Concerns did an excellent job in promoting and recruiting new volunteers. 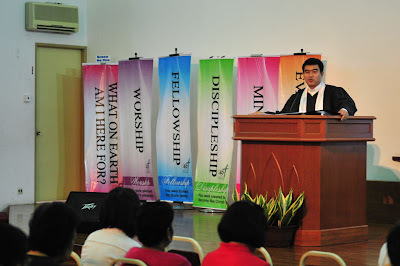 The much awaited event eventually came after church service yesterday morning. 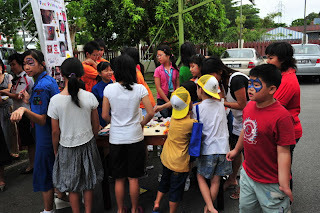 Thank and praise God everyone enjoyed themselves and for the good weather - the rain came after the event was over! Enjoy the photos! 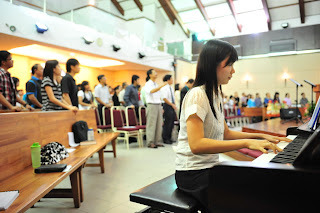 Sharing by Grace Len, photo and posting by James Wong. 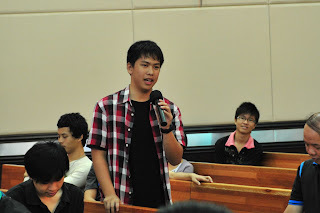 I've been here in Miri for two years now. Sis Wendy first brought me to this church. Being a Christian for almost 15 years now, I've backsliding until God called me back early this year. Since I've been faithfully attending GMC and my life has been transformed. At that point of time, I was just attending church; listening and receiving God’s word. I had wanted to catch up with everything that I have missed out over the years. Many of the things I have learned about God have almost been forgotten. But I know that all I needed to do is just to hold on to His Word and Promise for me. One Sunday God spoke to me through Pastor Law’s sermon. 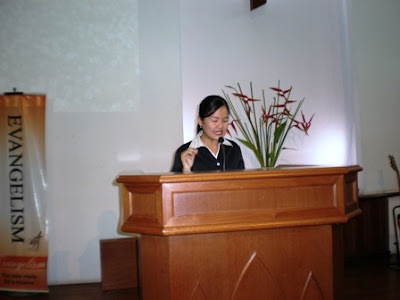 God had wanted me to serve Him, to do His work. He wanted me to live my life in accordance to the faith I have received from Him. But I told God, ‘..I just came back to You, after all these years. I do not know anything and my knowledge is limited. How can I serve You? I am not ready yet.’ I doubted my ability and knowledge, in what I can do for Him. But God said to me, ‘Yes, this is true but You have nothing to offer to me, except yourself and You heart. That is all I want- a willing heart.’ That is only what God had wanted from me! "Teacher, let us help you. We want to serve here. Can you make us the class monitor and assistant monitor?" "Never mind the differences between people and the things you think you can or cannot do because at the end of the day, God sees our heart. He sees your heart." Brothers and sisters, if today God has spoken to you and you are touched by this testimony, I urge you to take that bold step, like what I did. You will be amazed at how much God can work through you and how much changes you will see in your life and the life of others that you have touched. 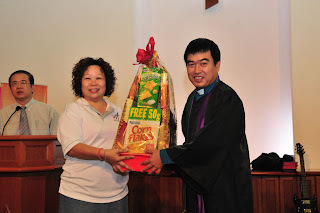 Message by Pastor Connie Yong, posting by James Wong. Pray that every person involved in 40 Days of Purpose will be refreshed, renewed, and revitalized for the ministry to which God has called them. Pray for the truth to be put into practice that “every ministry is important,” whether visible or behind the scenes. Pray that people will discover and use their spiritual gifts and abilities for God’s eternal purposes. Pray for each person to have a servant’s heart and serve wherever needed. 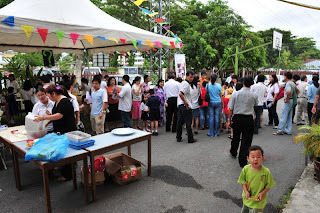 Pray that the Ministry Fair event will encourage everyone to become involved in ministry. Pray for ministry leaders to inspire and equip new volunteers as they shepherd them. Praise the Lord for He through the power of the Holy Spirit sustains us until the fifth week now. I believe you have learned very much from the book, the Purpose Driven Life. I believe you will feel that the more serious and committed you are in reading the book, the more you feel that you have no regret in signing up for this campaign. I also believe you that you may constantly ask yourself this question: After you have done all the learning of the book, in the Sunday worship sermon and the small group discussion, how do you put into practice all the 5 purposes? The fourth purpose tells you a very concrete answer. You are shaped by God to serve Him – ministry. You will find that Pastor Rick Warren try to give you a wide spectrum of the meaning of serving God. I pray that as you read the 7 chapters on ministry, you will be very convinced to sign up for at least one ministry in this church. I pray that you will find the 7 chapters so practical that that is no excuse for you not to serve Him. I strongly believe that you will make a difference for Jesus as you make that commitment. 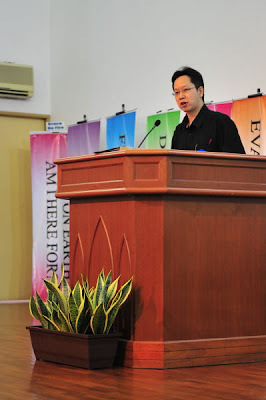 Message by Andy Chew, photo by William Ting, posting by James Wong. 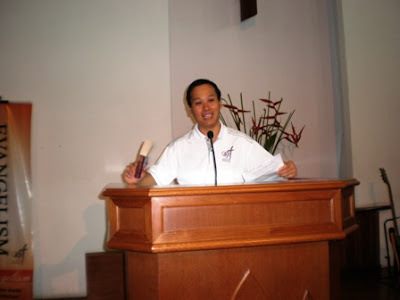 Pastor Law always reminds me of sharing life transformation experience. In many ways I am like you, probably more so for me as a young Christian - still searching for the right answers to the many questions about life and living. 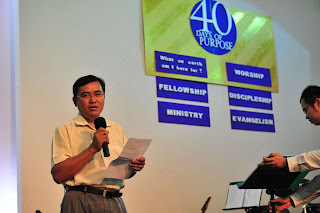 The Purpose Driven Life and the 40DOP campaign have helped me in my spiritual journey, because they helped me understand the word of God better. The power is in the word of God. I am convinced that to grow spiritually, we need to fight against three enemies, (i) self, (ii) the world, (iii) the devil. It is always easy to identify the last two, but not the first. Don’t fight the world nor the devil, if you have not dealt with yourself - the Bible taught us that we are sinful in nature. There is no short cut in spiritual growth – I need to crucify the desire of my flesh. "Counting the cost” – this is what accountant like me does best. The "Cross", is the "cost", the "price we pay". I am convinced that I cannot be a disciple by simply attending the Disciple course, or doing theological study, or going to the church or cell group. No, I need to pay the price to be one. I need to count the cost. The first area I need to count is where it hurts most, i.e. my wallet. Another area I need to count my cost is my career. Another area I need to count my cost is my time. I am very busy with my work on week days, and on weekend I look forward to a much needed rest. To run BB, I need to commit my time, to supervise a bunch of highly energetic boys. Without focusing on myself, I found that I have a little less greed, a little less pride, a little less jealousy, and a little less bitterness. And God replaces that with a bit more generosity, a bit more humility, and a bit more joy. All I’ve said above are things and events I can decide on my own. Those are trivial things. There are times when God allows things in our life that we have no control of. Rick Warren said God uses every circumstance in our life to help us grow. That circumstance for me was when Siew Yew was sick from Dec last year to April this year. What did I learn during that difficult period? The first thing I learned is that I don’t have the gift of healing. But God gave me something else. He gave me His love, channelled through the many brothers and sisters who are seated here today. The visiting, the prayer, the encouragement, the helping out with the children, and even the rebuking. He also gave me humility, so that when people rebuked me I can take it. 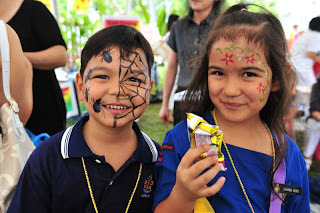 God also showed me how precious are His gifts to me in Siew Yew and my children. 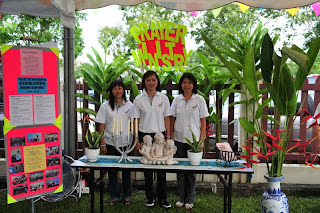 When Siew Yew was frail and sick, I thought she might not be with me much longer. This really put into context all the foolish arguments we had in the past, driven by self-centredness over petty issues. Now I treasure her very much. Now, every move she makes, every breath she takes, every slumber she takes – they are all God’s blessings. She struggled to do all those simple things in life when she was sick. So, husbands and wives, bear with one another. If things are not working out, make it work! Just over 4 years ago, our marriage was under threat. Now we have just celebrated our 15th anniversary. If there’s anything standing between you and you spouse, take it all to Jesus. Make it work, for you and your children. All honour and glory be unto Jesus. God bless and thank you. We are now doing the third life purpose on earth for which God created us – be like Christ (Discipleship). I pray that you will find this purpose on earth tangible and practical, like the second purpose, fellowship. After you understand your first purpose on earth is to worship God, I am sure you desire to make it happen. You can do it in fellowship. But as you do it, you will find that you need modeling. You need a good example to live a life of worship. And so the third purpose of life on earth answers the need. The best example of a life of worship is in the person of Christ. Therefore it is no surprise that you need to be like Christ on earth. It is something that God, in the person of Christ, has put in my heart and mind for a long time. You know what, as I preach, teach, pray, visit and minister, there is always this deep longing in me that I need something tangible for me to model. Somebody has to show me to do it best. I always find that our Lord Jesus Christ is the best model and only person to show me the way. He is the best person to show me how to obey and worship God who is revealed in the Bible. That explains why I get so personal with Jesus and I am so passionate with Him. I pray that you see what I see in Jesus. Follow Jesus, your life will not go wrong. Departing from Him, everything will go wrong! Pray that participants in the 40 Days of Purpose Campaign will have a renewed desire to pursue spiritual habits in their lives. Pray that each person in our church would increase in spiritual maturity and godly character. Pray for the personal desire of each person to grow in the knowledge of God through His word. Pray that the 40 Days of Purpose Campaign will give a new understanding of suffering. Pray that trials will be viewed as opportunities God allows for our growth. Pray for God to give insight to people as to how they can help others progress in their faith. Thank God for all the people who have had a part in helping others grow closer to God. Photo and posting by James Wong. The Special Edition Bulletin will be distributed during this weekend's morning and evening services to all GMC members and participants of the 40 DOP. 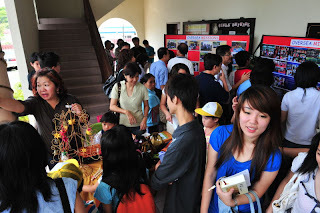 The 8-page bulletin was specially printed in conjunction with the upcoming Ministry Fair (Jul 27) and Mission Fair (Aug 3). 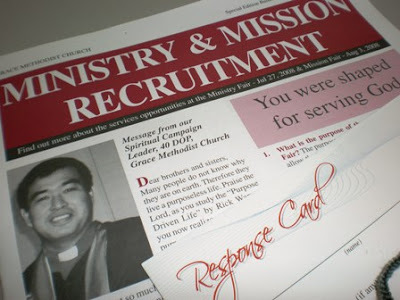 The bulletin is released one week earlier before the Ministry Fair to enable all participants to read and explore where they could serve out their spiritual gifts and passion to the right ministry. 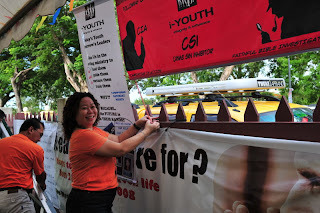 There will be ten booths showcasing their respective ministries during Jul 27 and three booths during Aug 3. 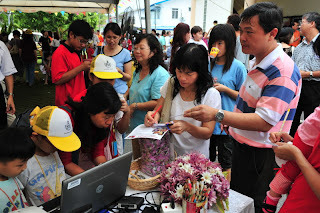 Visitors who want to respond can always fill in the Response Cards readily available at both Fairs. 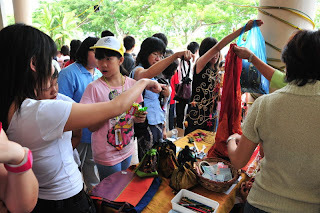 Both fairs will be held at the church premises. All are most welcome! 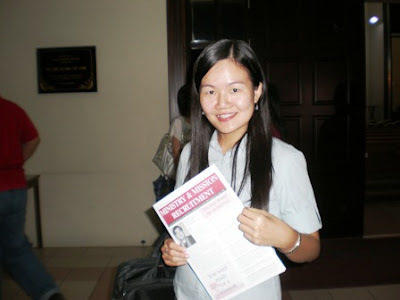 Message by Wong Sing Ngii, photo and posting by James Wong. I learned that we were made for relationship; to love God (worship) and to love other people (fellowship). The Christian life involves more than believing; it also involves belonging. God created us and wants us to be part of His family. The five characteristics of developing and deepening relationship with others have impacted are :1 Authenticity - 2 Courtesy - 3 Mutuality - 4 Encouragement - I have a special child, Phoebe - a slow learner as compared to other child of her age. 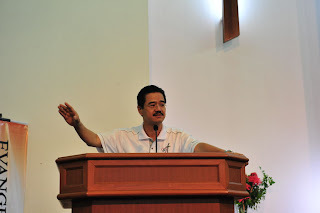 My wife and I were greatly comforted, encouraged by Pastor, brothers & sisters. Thereafter we are able to bless other parents with special children as well. I would like to thank Bro. 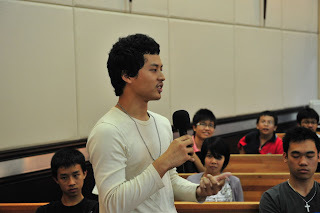 James Wong for encouraging me to take up Discipleship I at the end of last year. We need a spiritual partner encouraging in his or her quiet time, faith and spiritual growth. I truly experienced the hospitality of two sisters. 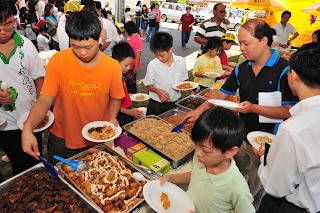 A few brothers and I were invited for regular meal with them. We’re relaxed and opened to share and encourage each other. 5 Unity - Roman 12: 16, “Live in harmony with each other. Do not be proud but be willing to associate with people of low position. Do not be conceited.” Now I am able to say “I am wrong”, “Forgive me” and “Sorry” without fear or hesitation. Relationships take time and sacrifice. Pray that the harvest will be plentiful – that those who are spiritually lost will come to a saving knowledge of Jesus Christ. Pray that the 40 Days of Purpose Campaign will encourage many to become committed to our church family, to take the steps of membership, and to follow Christ’s example and be baptized. Pray for unity and harmony in the new small groups and Sunday School classes. 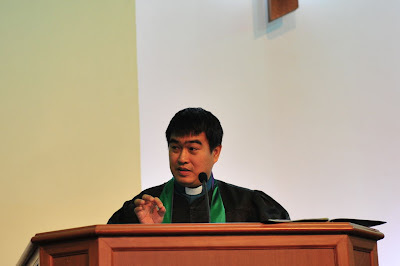 Pray that those who visit our church will be warmly welcomed. Pray that they will return and get connected into long-lasting relationships. What is more precious than the salvation of your souls? Jesus is so concerned for your souls that He pays the price to save your souls. Your souls matter to Jesus so much so that He is willing to die to save. Can you know how much God loves you? This is how I see myself and that is why I throw in everything (all my life) to love God. My response to God’s sacrificial love for me is to love Him back. I love God every day. In fact, literally, every day, I have joy in my heart and in my family just because we love Jesus every day. I pray that in the coming week as you read (listen to the sermon and discuss in the Small Groups) the next 7 chapters on fellowship, on the need to belong to the family of God, you will find Jesus or you will sense the need to get more personal with Him. I pray that you will be like me as you love Jesus everyday - you will experience joy in your heart and family. I pray that whatever challenges you may be facing in life right now, as you know and love Jesus - you will get all the answers from Him. All the more as you discover the importance of fellowship for God’s children, you will love to be in fellowship with one another. Then I pray that you will also get the support and encouragement you need so much to walk this journey of faith. 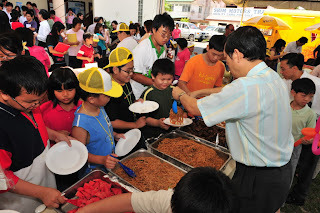 Sharing by Duan Seling on July 6, 2008. Photo and posting by James Wong. Things that deviate from their designed purpose – usually end up getting worn out. In Psalms 119:28: The Bible says – “My soul is weary with sorrow...” Even the soul gets worn out. The bottom line is that, I grew weary both mentally and spiritually with the wrong purpose. “The Purpose Drive Life” by Pastor Rick Warren and it pointed me in the right direction by highlighting the important portions of the Bible. We are all created for God’s pleasure. This revelation also helped me out of my weariness of the routine – to know that I have a purpose and direction for eternity! 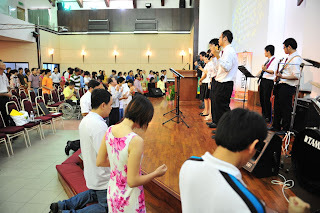 Worship no longer meant just the two short hours at church on Sundays, but it mean a change in lifestyle altogether. If you are feeling weary, I would like to invite you to seek God and ask “What can I do to bring pleasure to You?” Be honest about how you feel and what you want. If you don’t feel that your life is not pleasing worship to God – then ask God for a heart of worship! Seek God for a heart of worship! And you shall surely find what you are searching for. For it is in this pursuit that we’ll find strength! God bless. Jun 29"What on earth am I here for?"